The raconteur and performance artist, made famous last year for his piece about the manufacturing of Apple devices in China, in an amalgamation of tales, about Burning Man, Disney World, and Zucchotti Park, the site of Occupy New York. 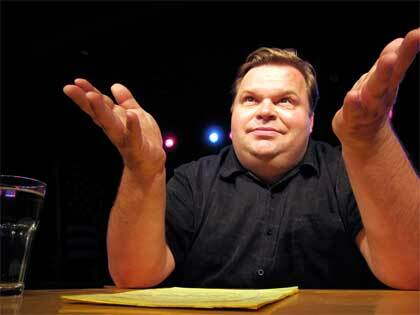 I saw Mike Daisey some years back at the Oberon Theatre in Harvard Square, under the auspices of the American Repertory Theatre, when he was a little known performance-artist-raconteur. I do not remember much about his performance at the time, but I was struck by the fact that here was somebody new doing something like the late Spaulding Gray used to do. In the last year or two, Mike Daisey became famous almost overnight for a show of his called The Agony and the Ecstasy of Steve Jobs which, in one of its several parts, recounted Daisey’s travels to the Foxconn factories in China where the bulk of Apple’s products are manufactured. Daisey’s vivid and scathing account of the terrible working conditions in the factories brought almost immediate public attention to the issue. In response to the hubbub around the Apple story, Public Radio International’s acclaimed show, This American Life, hosted and produced by Ira Glass, enlisted Daisey to give a piece of his Apple performance on the air. It also gained a huge audience and made considerable waves. Some months after that airing, This American Life produced another show which called into question some of the salient facts and figures which Daisey had presented in his Apple piece, and, to confirm these suspicions, included an interview with the Chinese translator who had traveled to the Foxconn factories with Daisey. As part of this airing, This American Life brought Daisey back onto the show and openly challenged him. Faced with the evidence, Daisey acknowledged his errors and, to some extent, apologized for them. However, he did make a case on his own behalf, arguing two main points. First, he claimed that, though his performance piece was related to journalism, it was essentially theatre rather than reportage, which, in his view, gave a degree of freedom to embellish for purposes of effect. Second, he argued that the impact of the piece as presented was positive, and had engaged and alarmed the public in such a way that attention was indeed brought to the unfortunate working conditions at these factories in China. Without going into a detailed philosophical critique of these arguments here, suffice it to say that: regarding the first, one might well respond that it would have been ethically and aesthetically appropriate for Daisey to let his audiences know that he was embellishing facts for the purposes of drama; regarding the second, one might well call into question any case that declares that ends justify means, especially when, in this case, the embellishment of facts seems unnecessary to bringing about the desired ends. In short, these arguments were not very satisfying, and it seemed that, after precipitously soaring in public recognition and esteem, Daisey’s credibility crashed in an equally precipitous manner. It struck me that the sheer embarrassment of the turn of events might have caused him to stop performing entirely. In fact, it is quite soon after the whole Apple/This American Life episode and Daisey is back in the saddle, going full tilt in a different direction. The current show brings together three different themes: Burning Man, Disney World, and Zucchotti Park and Occupy New York. Burning Man, for those unfamiliar with it, is a kind of contemporary annual Woodstock held in the Black Rock Desert of Nevada. 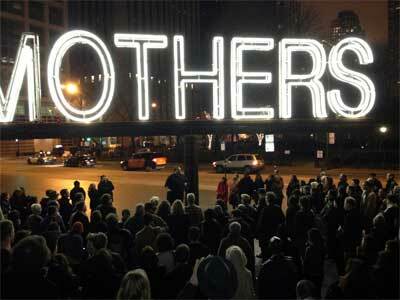 It goes on for a week and involves tens of thousands of people doing all sorts of things artistic, dramatic and communal. Its iconic emblem, a large wooden human figure, is burned ceremonially at the end of the week, which gives the festival its name. Daisey’s account of his time there is hilarious. By his own account, he went with considerable unfamiliarity and trepidation, and, in retrospect, gives a blow by blow account of each jarring moment of his time at this hippie arts fest. One might figure that Daisey, as a seasoned performance artist himself, would have fit right in, but his general modus operandi seems more culturally conservative than that of the median participant at Burning Man. Daisey’s awed and overwhelmed description of the long and intimate welcome hugs he routinely got from the men there is pricelessly funny. The description of going to Manhattan’s Zucchotti Park after Occupy New York had ended, and being a witness to the echoes of its aftermath, was more plaintive than amusing and brought the two preceding, more ironic, themes into contemporary political focus. Overall, the grouping of these impressions of three very different “American Utopias” carried interesting collective weight. Despite obviously carrying a recent burden of embarrassment associated with the Apple piece, Daisey was in fine and hilarious form. His forcefully punctuated and dramatic manner of delivery gave momentum to his pieces. At the end of the show, Daisey led the audience out onto the street corner, where he orated his finish with a kind of soapbox earnestness that seemed in keeping with the inspirational character of the account he gave of Occupy New York. Given that the Occupy New York piece, especially, has a collectivist, idealistic flavor and brings with it an apparent political earnestness on Daisey’s part, I think it would have been germane for him to make a self-reflective nod to the issues about performance, journalism and truth-telling that had been raised so significantly around his Apple piece. If he had brought that degree of personal vulnerability into this show about utopian visions, it might well have added a more resoundingly idealistic dimension to an otherwise interesting, rousing and entertaining evening.